- Grinning Man in the Moon peers at a single star. Made of cobalt glass. Approx. 4" in diameter. Comes with a hemp cord and glass beads for hanging. 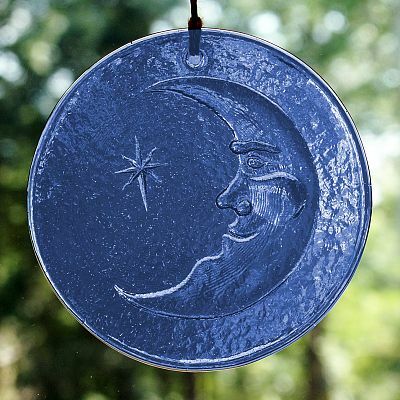 Do you have any other questions about our Moonbeams Suncatcher? Every item I have bought through this company has been an excellent purchase. The customer service is top notch and I am really happy to find a company like this. Thank you for another excellent product. The sun catchers are a lovely addition to our home. I have an east facing window and I have several crystals and suncatchers hanging in it. The moon works well with everything. I have ordered other items and will always look here first. Great service great stuff. Gryphon's Moon was great... I had to order a lot of suncatchers for a favor for a friend's baby shower, and I needed them a week before the date of the shower. They emailed me to tell me that they only had a partial order available to ship, but they assured me that the entire order would be received well before the shower. I didn't have to worry about anything- great customer service in a day and age where the concept of customer service tends to be neglected.